Despite our great love for adventures, Nic and I somehow ended up unfashionably late to the snow party. In our much younger years, Nic was an elite athlete and I was a ballerina so we were both banned from any skiing or snowboarding that could compromise our precious limbs. 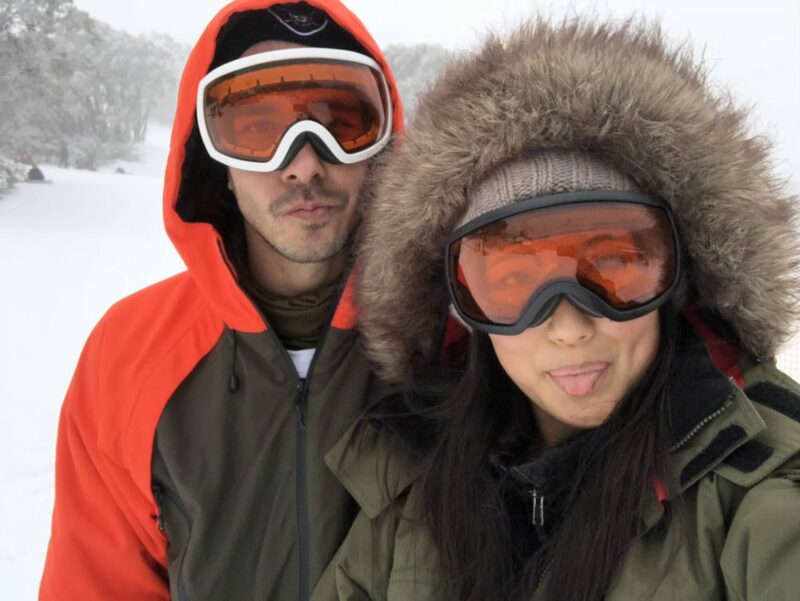 Not knowing what we were missing, once we moved on to new careers and were free to adventure away neither of us ever really had the occasion to make up for lost time on the slopes. 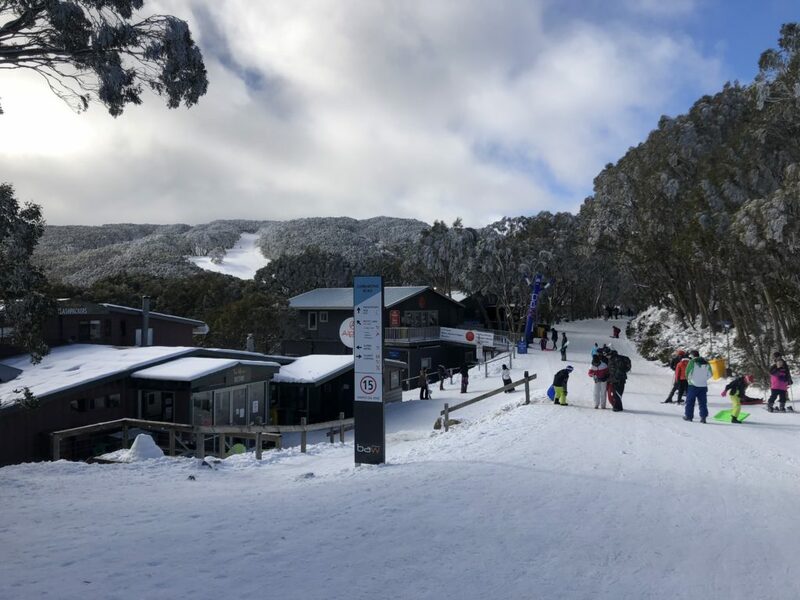 That was, until, the wonderful team at Mt Baw Baw invited us up last weekend for our first ever snow sports adventure. Nic had been to the snow a few times but never to ski or snowboard and I had only seen icy snow in European cities and couldn’t even imagine the joys of powdery mountain snow. Despite my deep disdain for the cold, we were both curious to understand what the fuss is all about and get our heads around why it’s a yearly trip for so many. I had this same thing with surfing before I first tried it – I just couldn’t fathom why anyone would get cold and wet everyday just to ride a wave for mere seconds and then have to paddle all the way out again. Same for the snow – why head towards the cold weather on purpose for snowy slopes that you whiz down only to have to get a lift back up again and then do it over and over. BUT, like so many experiences, you really DO miss out if you live in ignorance and must always try new things before you judge. So, how did you I feel about snow? – amazing), it is absolutely magical and brings out the inner child’s sense of wonder. And once you do get inside, nothing has ever felt so cosy and rugged up. We spend two nights in one of the Snow Gum apartments, which was simple on first sight but also came with a beautiful big fire, a full kitchen and a spa bath (which it turned out our muscles needed desperately)!! So I turned into a huge kid and was rolling around on the ground like the flog I am for the whole first evening. We kept boarding after our lesson for a little while, but didn’t last very long as we were totally exhausted! But there were other fun things to do outside of skiing and our favourite was the Howling Husky Sled Dog Tour. There are lots of different routes and we just did a quick one with seven beautiful dogs all with their own name and story, but got to see some of the Black runs (so yes, for the more experienced skiiers there are difficult mountains up there) and the scenery around the place. And the best part was cuddles with the dogs afterwards, most of whom are rescue dogs and thriving with their new jobs – SO CUTE! The food up there is also amazing – there are only two places, the Alpine Bistro which is pub-style and then the more restaurant style Village Central restaurant and their menus aren’t extensive, but the food is very high quality and brought to you by fine dining chefs who love the snow lifestyle. On weekends, you need to book for dinner so make sure you don’t miss out (but the kitchens are very well equipped if you prefer to cook). Snacks are little bit hard to come by so if you’re a snack fiend like me, I’d pack some spares and same if you have special dietary requirements. There”s also snowshoeing, tobogganing, cross country skiing and beautiful alpine dingos, Warragul and Rowdy, who you can meet and play with. Overall, a wonderful place to escape for a weekend away and we’ll definitely be back! Follow along at @mtbawbaw or head to their website!